Eating is controlled by many factors, including appetite, food availability, family, peer, and cultural practices, and attempts at voluntary control. Dieting to a body weight leaner than needed for health is highly promoted by current fashion trends, sales campaigns for special foods, and in some activities and professions. 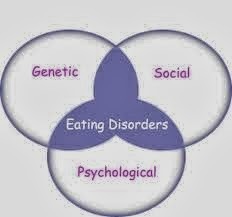 Eating disorders involve serious disturbances in eating behavior, such as extreme and unhealthy reduction of food intake or severe overeating, as well as feelings of distress or extreme concern about body shape or weight. 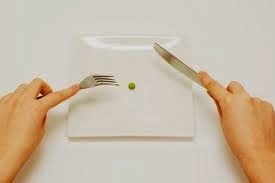 Researchers are investigating how and why initially voluntary behaviors, such as eating smaller or larger amounts of food than usual, at some point move beyond control in some people and develop into an eating disorder. Studies on the basic biology of appetite control and its alteration by prolonged overeating or starvation have uncovered enormous complexity, but in the long run have the potential to lead to new pharmacologic treatments for eating disorders. Recurrent episodes of binge eating, characterized by eating an excessive amount of food within a discrete period of time and by a sense of lack of control over eating during the episode. Recurrent inappropriate compensatory behavior in order to prevent weight gain, such as self-induced vomiting or misuse of laxatives, diuretics, enemas, or other medications (purging); fasting; or excessive exercise. Infrequent or absent menstrual periods (in females who have reached puberty). 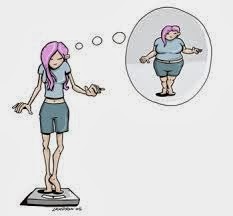 The binge-eating episodes are associated with at least 3 of the following: eating much more rapidly than normal; eating until feeling uncomfortably full; eating large amounts of food when not feeling physically hungry; eating alone because of being embarrassed by how much one is eating; feeling disgusted with oneself, depressed, or very guilty after overeating. Marked distress about the binge-eating behavior. Achieving long-term remission and rehabilitation, or full recovery. Early diagnosis and treatment increases the treatment success rate.